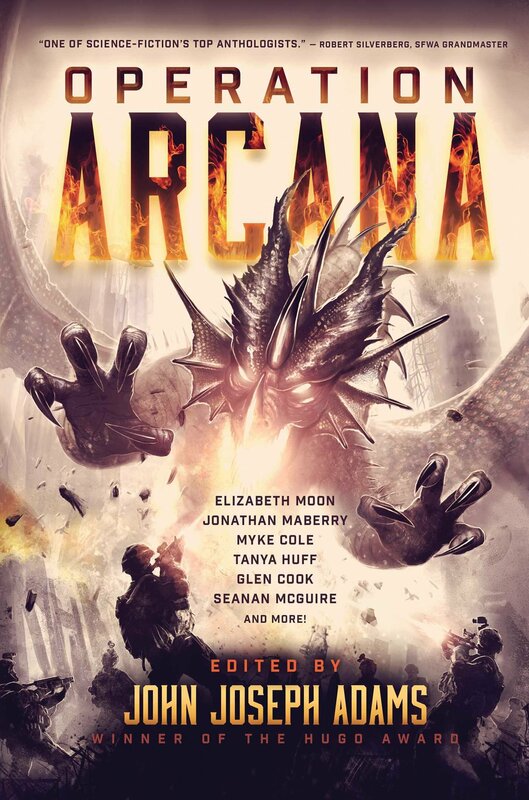 "Operation Arcana," edited by John Joseph Adams, published on February 16, 2015 by Baen Books. Combat has turned up in high fantasy at least since the Battle of Pelinnor Fields, and seven of the sixteen stories here are drawn from that tradition. Stories that asked "what if the allies in WWII had had magic?" have been around at least since Captain America fought Hitler, and seven of these stories come from that tradition. The steampunk story involves a more nineteenth-century type of warfare, while the Neverland story is in a class by itself. What almost all of these stories have in common is that they're uncommonly good. While we only recommended four stories as having the quality and sophistication we expect for potential Hugo Nominees, eleven more are still fun reads. By comparison, from a random set of 16 stories, we'd recommend only 2 or 3, we'd recommend against 6, and half of the remaining 7 or 8 would be "okay, but not much fun." Although we didn't give five stars to any story, we found four that were worth four stars. These stories do not, in general, pack a heavy emotional punch; don't expect to cry at the end. "The Company," an army with magical and ordinary weapons, marches toward an eventual conflict with "The Lady," a powerful, evil witch, but she does things to delay them and to try to gain control of them. This story revolves around one of those delays, but it focuses on a young girl, captured when she and friends unwisely tried to rob the Company. She has some power, although she's not trained, and it's possible that she may be of help--or not. The Red pass is all that stands between the Hakkian army and the people of the West. Kellur is an old, experienced soldier, and he knows his people stand no chance, but there's an old temple next to the Red Gate, where the "Sisters" worship the old gods. Kellur believes they have the power to save his people (even though they hate them) and he's willing to do anything to get their help. Anything. US Marines are used to war being Hell, but this squad is stuck there for real. Every hour a new demon materializes, and every hour they have to slay it. There are brief opportunities for people to escape, one at a time, but every soldier who escapes leaves the rest of them more vulnerable. Young Twig and a group of Black-Horn goblins have been captured by the Gibberer's band. Twig's people are cattle farmers, not really fighters, but they have strong magic to help them. Unfortunately, the only sorcerer in Twig's group is senile, and Twig's own power is useless. But he needs to do something. He and his friends will die from the bitter cold if the Gibberer doesn't kill them first.